While some historians believe that these castles, which rise several storeys and offer a strong military deterrent, had become obsolete because of the use gunpowder artillery. 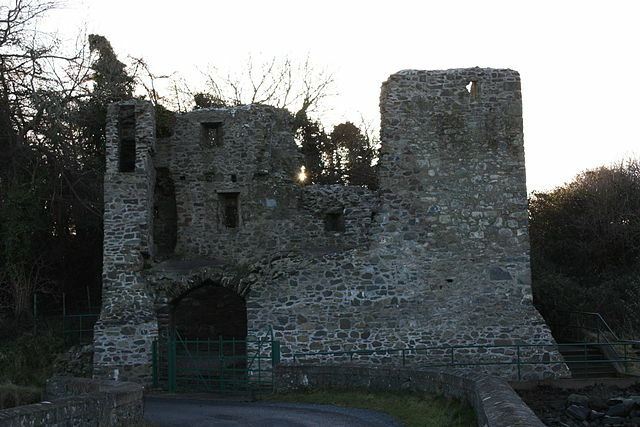 However, while gunpowder weapons were being used in Ireland by the late 15th-century, this did not put a dent in the construction of new tower houses, nor is there evidence that these castles were being overrun by sieges. McAlister notes that these fortifications would have remained a challenging obstacle even during the 17th century. These tower houses would have served as places to store trade goods, such as oats, barley, beef, live cattle and horses, as well as protecting the money that was coming back to the owners. This situation would change in the early seventeenth-century, with port towns such as Belfast and Carrickfergus becoming the focus of trade. The need for smaller-scale ports and creeks interspersed at strategic locations along the coast was consequently removed. There is a correlation between the Co. Down tower houses and anchorages and maritime ‘roads’. A shift away from these maritime routes reduced the need for tower houses. In addition to this situation, the opportunity for local lords to capitalize on their resources by exporting the produce from their lands from their own ports and creeks was eradicated by the overwhelming growth of Belfast and Newry. With the prospect for competition finally removed, the emphasis shifted to estate production, thus reducing the need for investment outside of expanding agricultural land, with the tower house a direct casualty of this. By the early 17th century one could see that tower houses were being used less and that other types of manor estates were being built. While some continued to be inhabited for decades and centuries afterwards, many were allowed to fall into ruin. It has only been in the 20th century that efforts started to conserve and rehabilitate these medieval landmarks. Now, many are available to use as homes or hotels – click here to read about how Helen Cassidy is selling castles in Ireland. Click here to visit the publisher’s website for more details. Vicky McAlister is an Assistant Professor of History at Southeast Missouri State University. You can read more about her research on tower houses on her Academia.edu page.